Coach Outman is in his ninth season coaching basketball at Wellsboro after spending the past 8 season as the head coach. Coach Outman is a 1983 graduate from Cowanesque Valley High School where he played three years of varsity basketball for the Indians and is currently the all-time leading scorer with 1,504 points. Coach Outman was also a two-time Twin Tiers All-Star, NTL West League Co-MVP, and a Tioga County Hall of Fame inductee. After graduating high school, Coach Outman attended East Stroudsburg University where he played basketball for three years while earning a B.S. degree in Health/Physical Education. He then returned to the area and started his coaching career at Cowanesque Valley High School where his teams competed for both a league and district title. Coach Outman then became an assistant varsity coach at Elkland High School where those teams won one district and two league titles. After his tenure at Elkland, Coach Outman returned to Wellsboro where he became the head coach of the Wellsboro Middle School team for the next eight years before accepting the varsity position in 2010. Over the past eight years Coach Outman's teams have compiled a 167-39 record while winning five NTL championships, three straight, and two District IV runner-up titles. In 2017-18, Coach Outman guided the Hornets to their second District IV championship in school history. 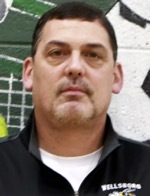 Coach Outman is now the head teacher at Wellsboro Area High School after spending the last 26 years teaching physical education at the Rock L. Butler Middle School. Coach Outman resides in Wellsboro with his wife Jennifer and her two sons, Nate and Nick. Coach Outman also has a daughter, Chelsey, currently attending Marywood University in Scranton, PA.
Outman, Davis win NTL Coach of the Year honors. Egleston following in her father's footsteps.